At Onedirect we put our customers first! Who better than our customers to talk about Onedirect's service? Two weeks after you have ordered, you will be asked to give us your opinion about your purchase and make a comment on Onedirect's customer service. Our sales staff are given ongoing training on all our products so they can answer any queries from customers. Find out more! "Pairing instructions come with the product but one of the Onedirect team emailed me instructions anyway just to be extra helpful. Would I buy from them again? Without hesitation." E.B. Your calls are very important to us and our team of professionals is always on hand to offer you expert guidance. "A swift and efficient service from them, the product being exactly what was required and their web site being easy to navigate." B.L. We have dedicated staff for large accounts and small and medium-sized businesses, who are trained to advise you on the best solutions for your company. Request a free personalised quote from our specialists! We'll answer you in less than 4 hours! Find out more! 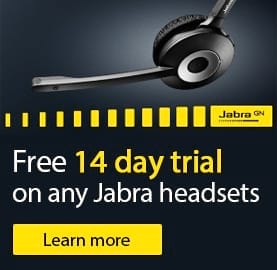 Try your headset free for 14 days! If you are not satisfied with it, we will refund you in full! Offer valid only for headsets. Find out more. We have over 2000 products in our catalogue, 98% of which are in stock! We offer free delivery to mainland UK on all orders over £75 pounds! Find out more! 96% of orders are sent the same day! All orders made before 2.00pm are sent the same day. Find out more! Our technical team is on hand to provide free guidance over the telephone to help get you started with your systems and will take care of any faulty products.